A Way Of Life Becomes Just A Memory? The NCCHA supports development of seminars, lectures, tours, demonstrations, and publications that encourage an appreciation for the history and cultural heritage of NC’s sound country communities. Radical changes are in the forecast for centuries-old coastal lifestyles, traditions, and occupations. Diversity invades the coast as Technology transforming traditions into obsolescence. 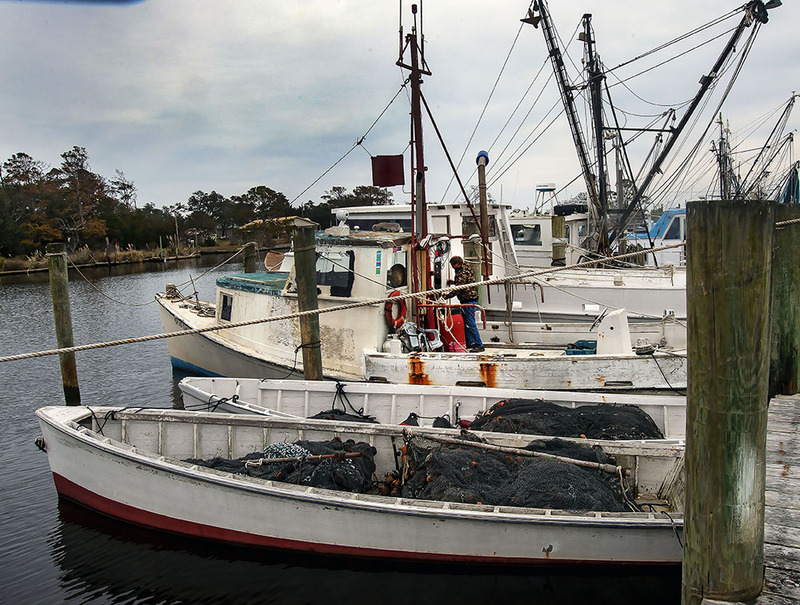 Environmentalist Rachel Carson observed, ”The lines between land and sea are constantly changing.” Lines that separate cultural lifestyles and occupations among coastal communities are shifting and dissolving. Communities are now impacted by a migration of new paradigms swept in with a rising tide of new development. NCCHA programs and projects can lead to better understanding of how the coast and the coastline are weathering the forecast changes. 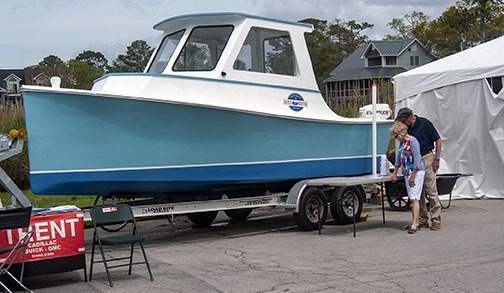 The Frances Mae, sporting fresh coats of paint and several tweaks post hurricane Florence, was a hit at the Oriental Boat Show, April 12-14. Reporter Greg Payne for an ABC affiliate captured David Booth and Ben Casey at work on the port side window for a full 8/10 of one second while panning scenes at the Oriental Boat Show. The clip aired on Friday evening, April 12. 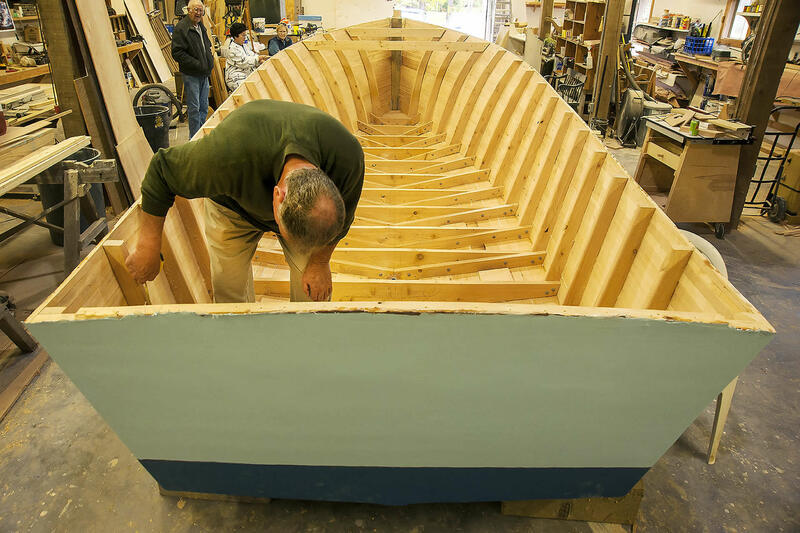 Fortuitously, the Frances Mae was located across the street from the booth where Ian Bryce, left, assisted by Heber Guthrie, right, was building the skiff that was raffled at the conclusion of the boat show. Many who stopped by expressed interest in meeting Guthrie, Frances Mae’s builder. Visitors offered a variety of positive comments and asked questions indicating a sincere interest in the boat and the work of the Association. A number of applications for membership were distributed by Michael Fulcher on Saturday. Questions were often focused on description of rack-of-the-eye and strip planking construction. Quite a few persons took time to study the pictorial story board illustrating the construction of Frances Mae. 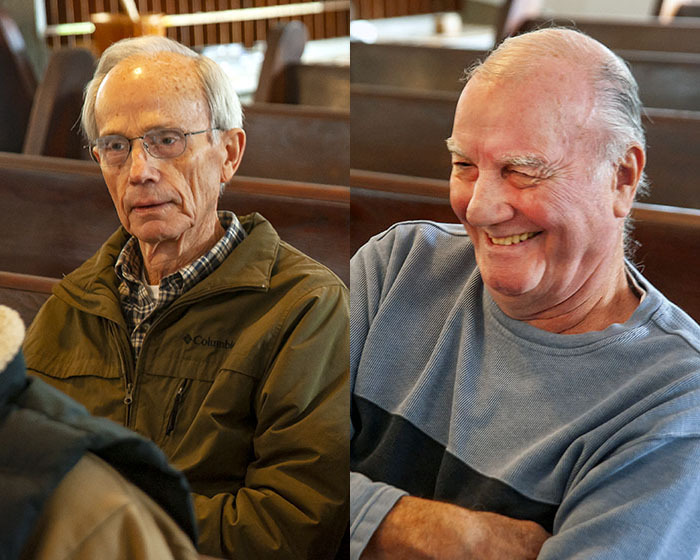 Discussions followed about the decline in Down East commercial fishing and wooden boat building. 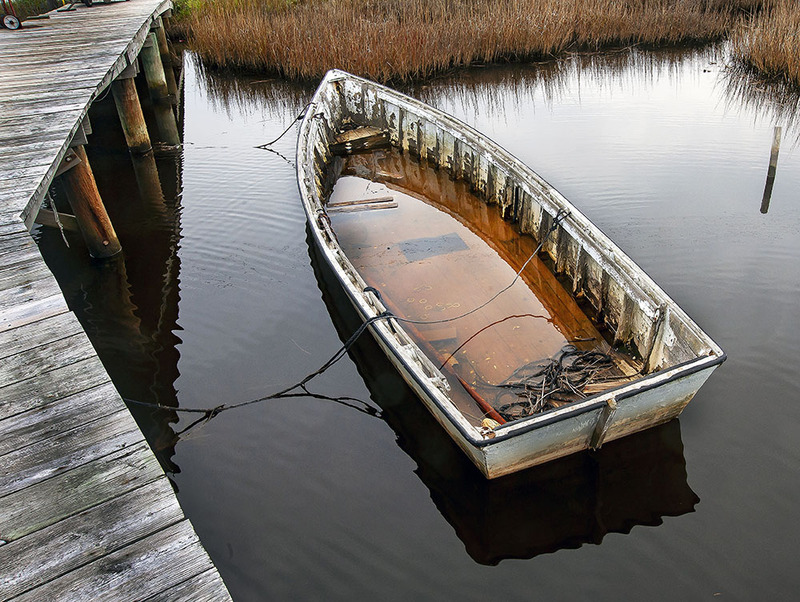 It was explained that this boat was probably one of the very last of its kind to be built Down East, that only 3 or 4 boatbuilding enterprises now existed where once there were over 2 dozen. This led to an explanation of the importance of the Frances Mae as an educational tool appearing at festivals, in parades, and at schools and civic club meetings. Of note, many questioned how a 90 horse engine could push a boat of this size. The lightweight juniper construction and the hull design comprised the answer. Aside from comments about the beauty of the boat, several asked if it were sale, how much would it cost to obtain a boat like this, one commenting that it would be a great boat for cruising the ICW for one or two people. 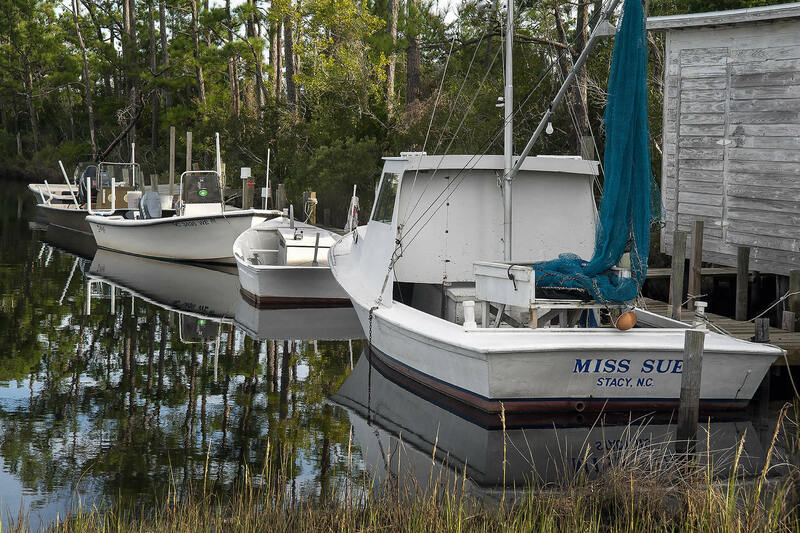 At the show, Ed Mitchell, CEO of the River Dunes community near Oriental, indicated that he would like to offer a boat slip for Frances Mae to be berthed for a few weeks after the Beaufort Boat Show in early May. This would provide more visibility for the mission of this vessel and the NC Coastal Heritage Association. Through her estate,Frances Mae Carawan, a native of Lowland, NC in Pamlico County, made many NCCHA projects possible. She would have been 95 on St. Patrick’s Day. 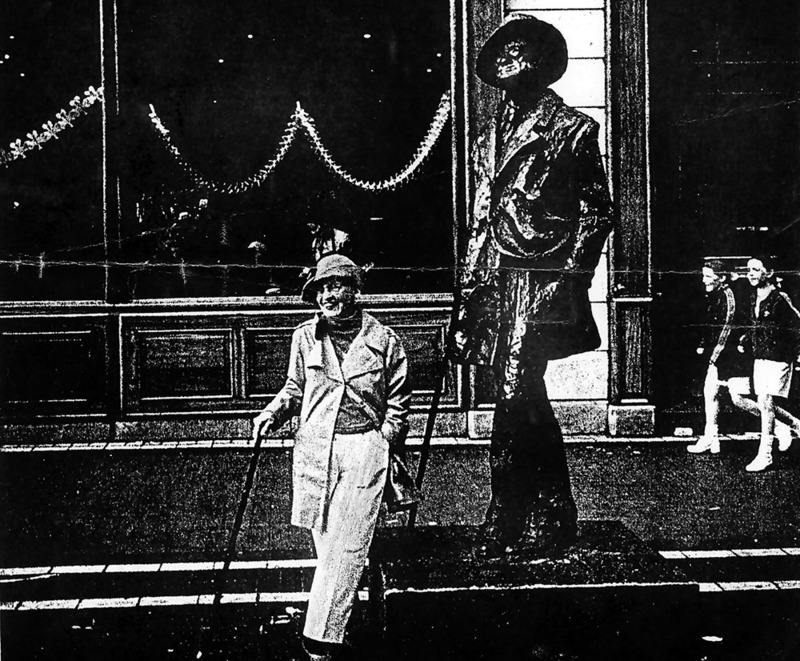 She made many treks to Ireland, whereupon she would always pose for a photo as she stood by the statue of James Joyce. 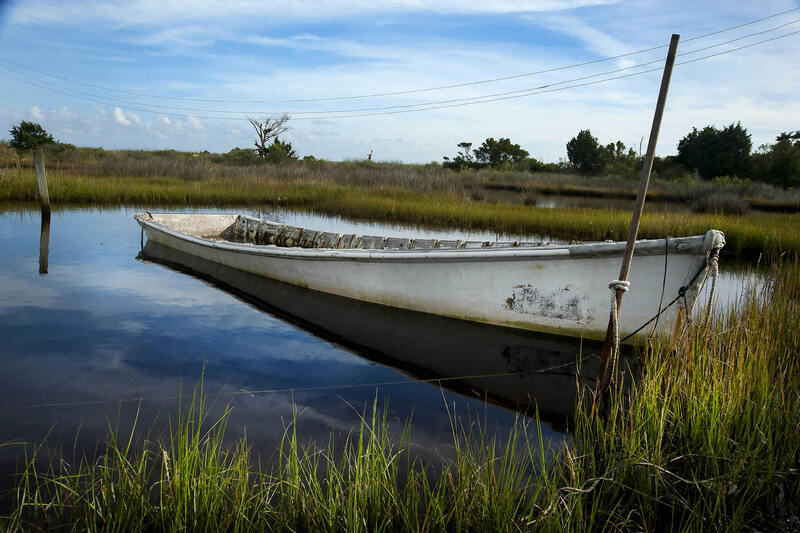 The Carawan estate grant to the NC Coastal Heritage Association has far reaching implications. 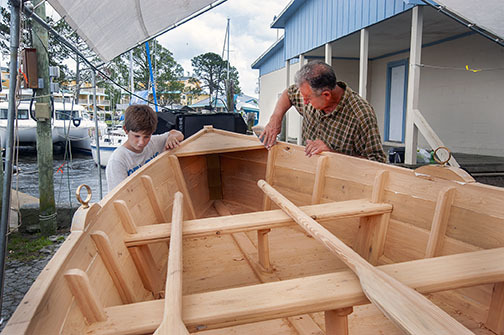 It has been the impetus for more donations to publish works on coastal heritage, develop seminars and summer camps for idle youth in coastal regions, and helped create a rack-of-the-eye Core Sound workboat built by Harkers Island native Heber Guthrie that will be a lasting documentary of Down East boatbuilding traditions rapidly becoming extinct. This non-profit is focused on creating other projects to provide documentation and preservation of traditions that are disappearing from the landscape of coastal communities to students of all ages, the young and the not so young. 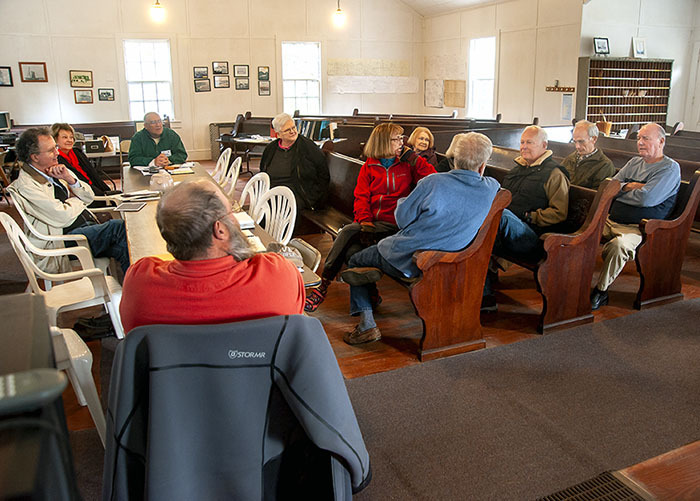 NCCHA members met at the Hunting Quarters Museum, Saturday, February 9 to elect a new board and make plans for the 2019 fiscal year. 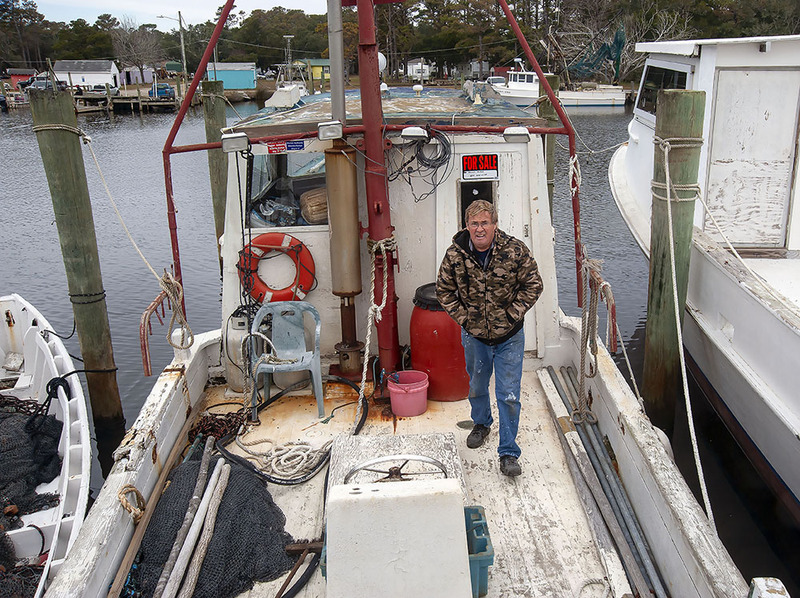 Keith Bruno, commercial fisherman and an advocate for sustainable fishing and conservation of water resources, from Oriental, was re-elected president. Flo Daniels, from Grantsboro, NC was elected vice-president. She is also the post mistress for the association. Michael Fulcher, from Stacy, NC was re-elected secretary/treasurer. Barbara Valentine, from Nashville, NC, and Keith Smith, of Oriental, were re-elected to the board. Wayne Willis and Steve Goodwin from Beaufort led a discussion about various aspects of coastal heritage. 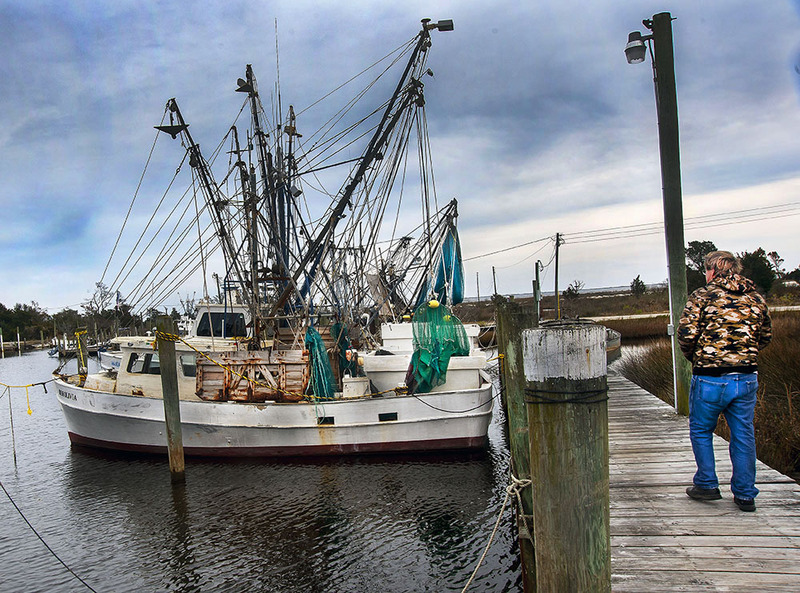 Goodwin has recently finished a book on the once thriving menhaden industry on the NC Coast. 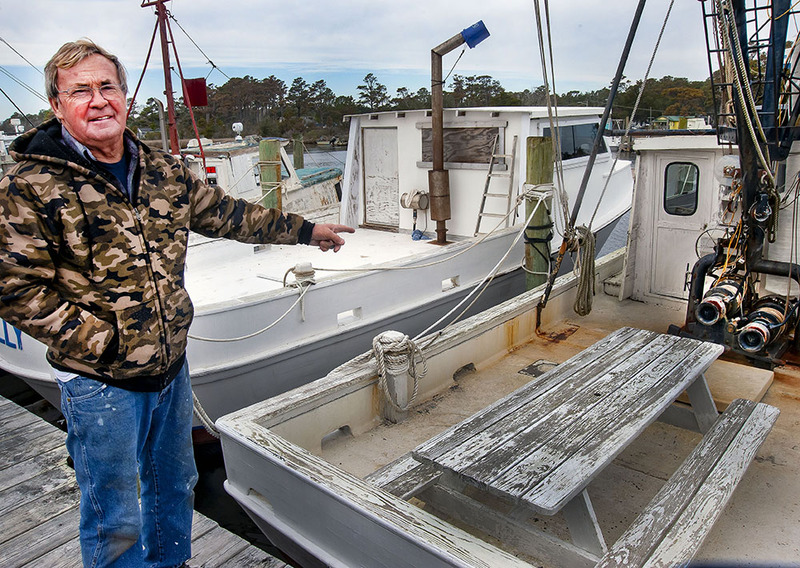 Steve Goodwin reported on his research on the menhaden fleet while Wayne Willis provided a colorful view of life on the coast. 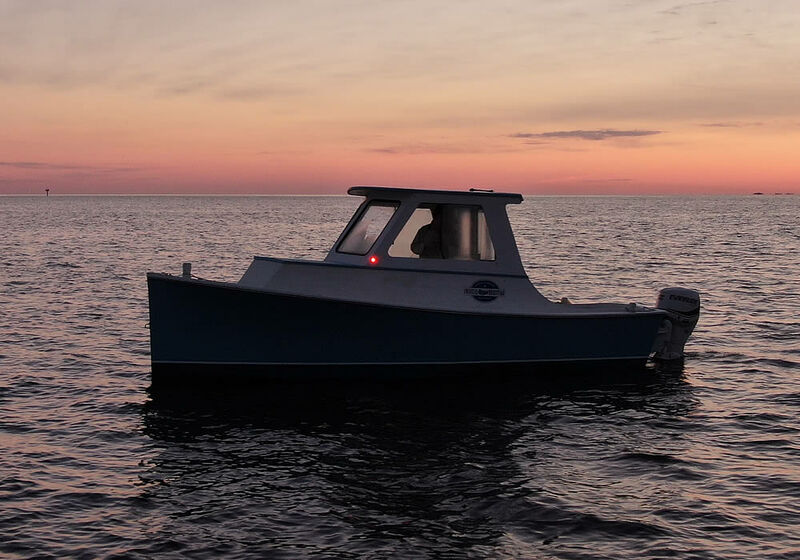 Display Heber built skiff (built 2018) along with photos/images showcasing NCCHA. Display MV Frances Mae in the water, and have booth with photos / images showcasing NCCHA. 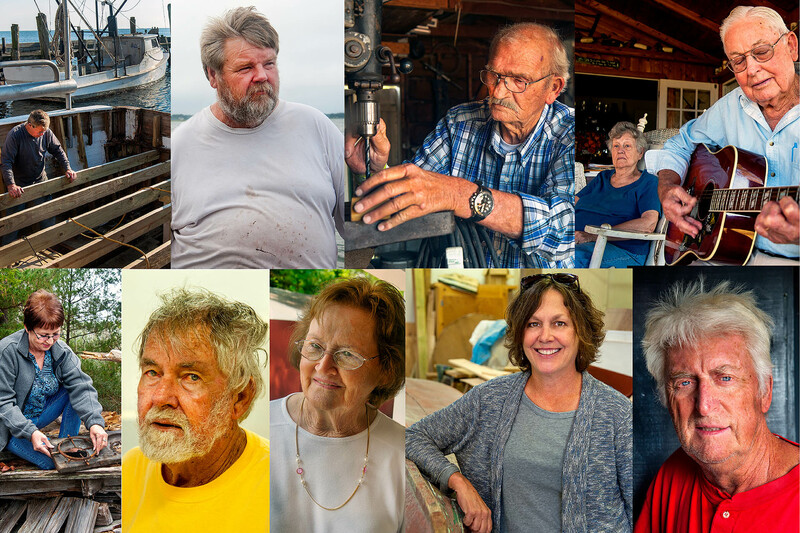 Publish Coastal Heritage Stories on nccoastalheritage.org Publish four stories over 2019. A mix of photos/text/audio/video – as determined by the subject matter. Upgrade web site to better present these stories. Normal maintenance, painting, perhaps move battery forward and port (build box seat just behind the cabin to house battery.) Add a second battery & wire both through existing switch. Target 100 new members for 2019. 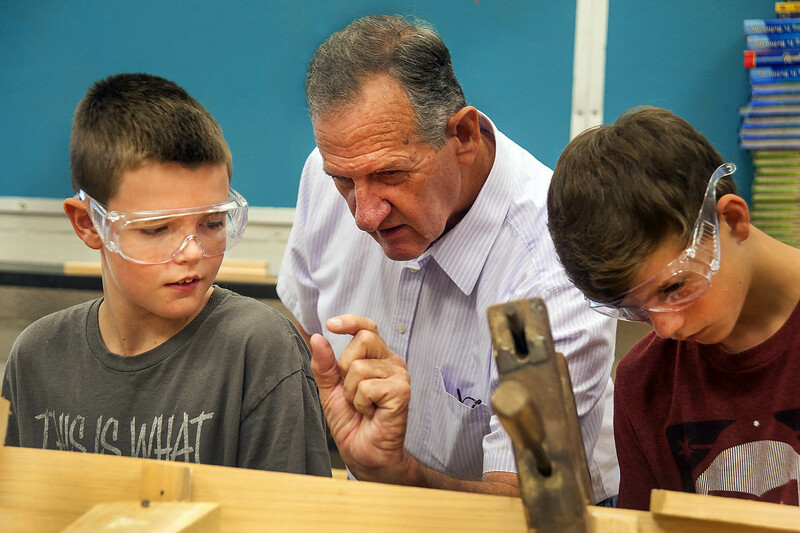 Find an individual that has the drive & skills to seek grants to support association Youth Educati, primarily workshops taught by Heber Guthrie. Two old salt Core Sound natives are experiencing a transition in their lives, one is a boat, the other is a man. 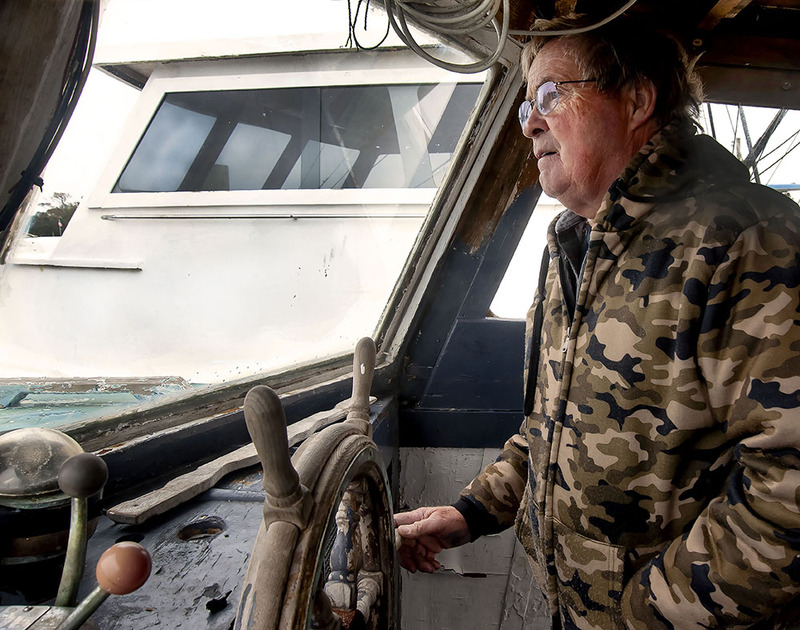 Danny Mason, 69, is a native of Atlantic. When he was 6 years old, his family migrated to Sea Level for a change in scenery. Sea Level is five miles south of Atlantic. Mason and his wife, Marie, now live in the Sea Level home of his school days. He grew up in a commercial fishing family, and just as so many other youth in fishing families have done from generations thorough the ages, he became a fisherman, working as a teenager before he finished high school. Mason was 15 when his stepfather purchased the Aileen in 1964. Aileen is a juniper wooden vessel built by Ambrose Fulcher in Atlantic in 1919. For almost a century, just as Rose, Guthrie, and Lewis, among others, were household names in the wooden boat building industry along the southern shores of Core Sound, Fulcher was one of the icons in the northern Core Sound communities of Sea Level and Cedar Island, and especially Atlantic. At 15, Mason was 30 years younger than Aileen when his stepfather acquired her. 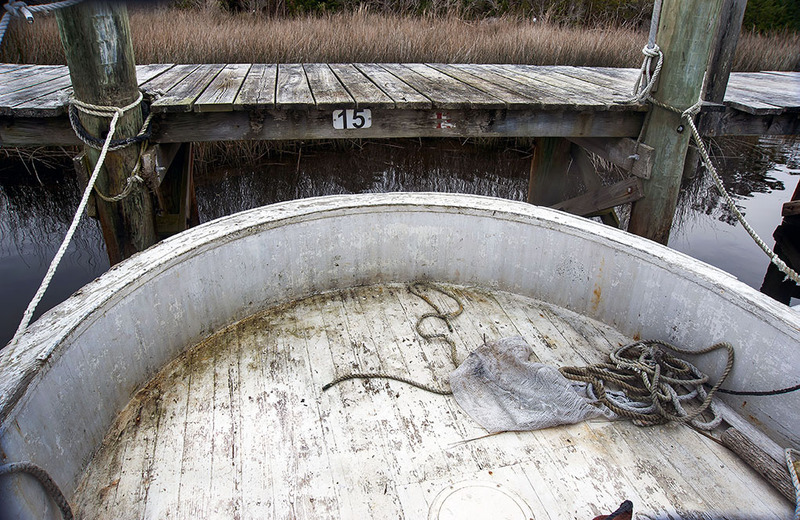 Now a century old, this vessel is considered to be the oldest fishing boat still working North Carolina’s coastal waters. Lawrence Early, author of The Workboats of Core Sound, University of North Carolina Press, 2013, devoted several pages to Fulcher, Mason, and the vessel, Old Salt. 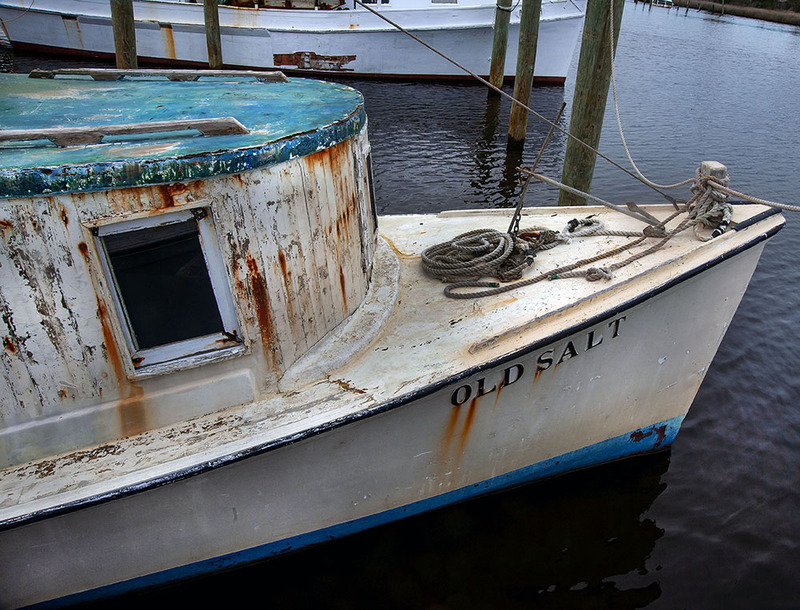 Early concluded that Old Salt was easily recognized by old timers as not only an Atlantic style Core Sound workboat, but also recognized as an Ambrose Fulcher boat. Early reported that Fulcher was not well known beyond Atlantic and did not live his life in the limelight, even in his own hometown. Fulcher was observed to simply arise early each day, take a walk, and go to his shop to work on whatever boat he had under construction. If he had no commission to build one at any given time, he simply built one on speculation. Early’s book included reports that Fulcher had probably built close to a thousand boats in his long career. Born in 1865, he was credited with completing a boat just a month before he died in 1952 at 87. Fulcher’s boats were noted for their tall cabins which were more comfortable for fishermen who stayed out for days while long haul netting. 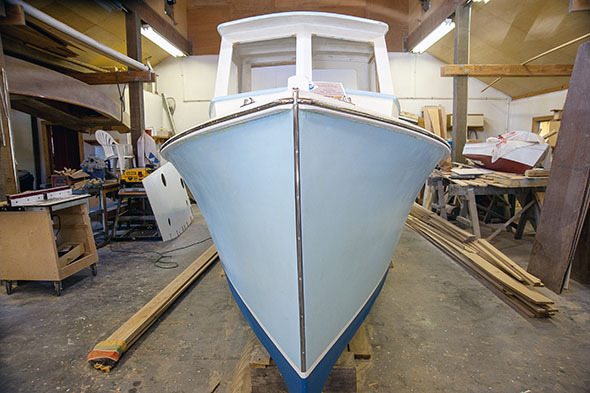 With a round stern and a low profile hull, many of Fulcher’s boats exhibited distinctive traits borrowed from sharpies, sailboats used for fishing and hauling freight. Fulcher built Aileen with an open hull and no deck. Though the boat was 39 feet long and 11 feet wide, its power plant was a small 16 horsepower, 2 cylinder Lathrop engine. There have been changes. Early concluded that the longevity of a wooden fishing boat was dependent totally on how well the vessel could be modified thought the years. Mason told Early that when his stepfather purchased the boat in the 1960s, the vessel had graduated to a Chrysler V-8 marine engine. They replaced that engine with a diesel. A chain of re-works on the boat were begun in 1977. In the late 1990s, the hull was fibe-rglassed. Early called an Atlantic workbook like Old Salt a mutable, changeable document. For steering, ropes pulled on the tiller when the wheel was turned. Mason says the steering now is a hynautic system, when the wheel is turned, air, not a piston, pushes against hydraulic fluid which pushes the controls that turn the rudder. The adaptations have not erased its classic Ambrose Fulcher features. Any new pilot for Old Sal, like Danny Mason, will be considerably younger than she is. He is considerably older than the skiff he plans to use occasionally in retirement. Mason’s reflections perhaps reveal a regret over not just his retirement from a career he has loved, but also an industry that seems to be headed to some form of retirement, or like old wooden boats, continued revisions and mutations. NC Poet Laureate Shelby Stephenson contributed an opening poem for the book, Sound People. He has published a new book, Our World. NCCHA invited to participate in Chowder Cook-Off, March 17. 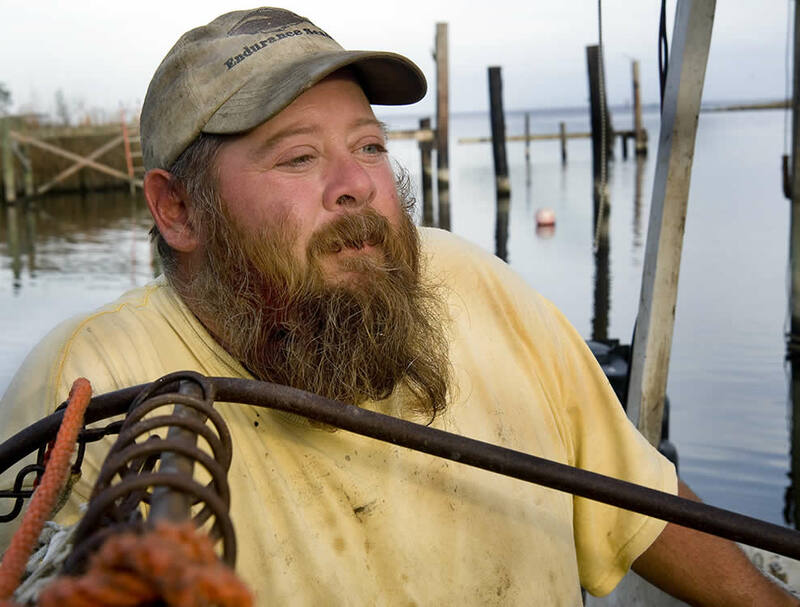 Commercial fisherman Keith Bruno of Oriental, NC is the new president of NCCHA. An strong advocate for a common sense approach to this industry, he is often sought by UNC-TV to provide narratives on many aspects of coastal heritage, from family life to the science of sustainable resources. Make a difference. Friends don’t let children of friends grow up without learning to appreciate their heritage. NCCHA is the organization that is speaking up for coastal heritage. 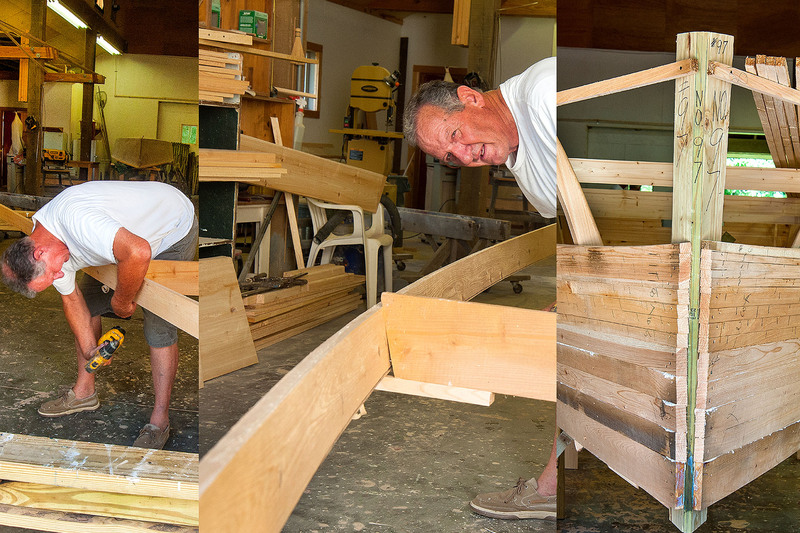 Folklore has spawned volumes about Core Sounders, their flat-bottomed skiffs and the Harkers Island boatbuilders. Sound People presents a record of conversations with down east natives. Core Sounders describe their cultural history, from their perspective. 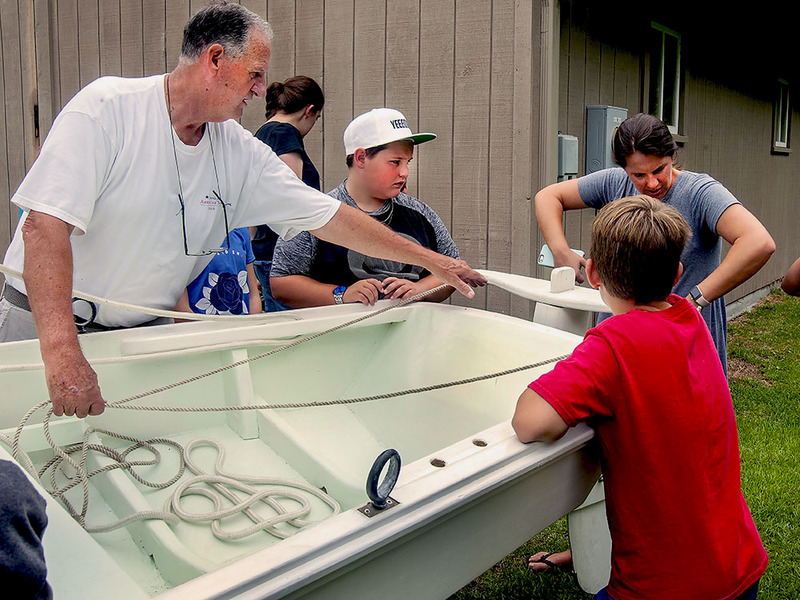 With construction of NCCHA’s Core Sound workboat in its final stages, NCCHA can begin focusing more on an expanding cultural/heritage education agenda. 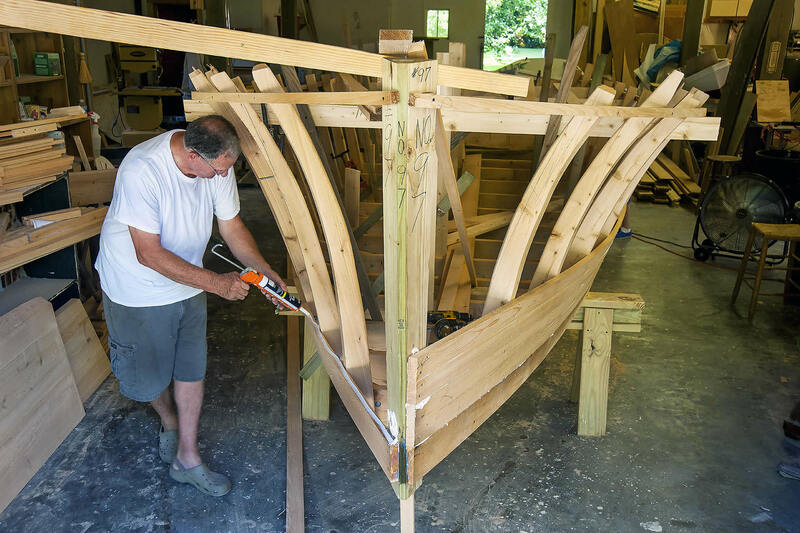 The Frances Mae, built by Harkers Island native Heber Guthrie for for the NC Coastal Heritage Association, is almost finished.